Why is it that miniature foods are so much fun? I've had the "mini" bug ever since I made these KY pies earlier this year for Derby. When I started to think about getting ready for Thanksgiving, I decided that I wanted to try to bake some miniature pumpkin pies. These pies aren't just cute, they are delicious, too! Unroll the pie crust and use a bowl or cup to cut circles out of the dough. Push the circles into the cupcake pan. You're half way there! Next just combine the pumpkin pie mix, evaporated milk, and eggs. While you are mixing the ingredients, preheat the oven to 425 degrees Fahrenheit. 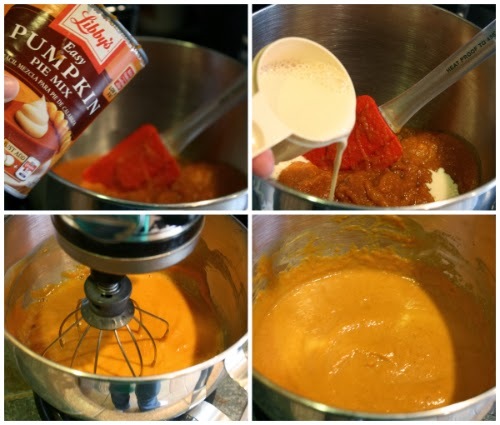 Spoon the pumpkin pie mix into the cups in the pan. Once all the cups are filled, bake the pies for 5 minutes at 425 degrees Fahrenheit, and then lower the temperature to 350 degrees and continue to bake the pies for 20-30 minutes depending on your oven and altitude. Pumpkin pies can be temperamental, so be sure to check on them frequently. The pies are done once a toothpick inserted in the middle comes out clean. Let the pies cool and then refrigerate, since pumpkin pies are best served cold. You can even add whipped topping (or cake frosting!) to make these mini pies even more special for Thanksgiving. Wishing you a Happy Thanksgiving from the Craft E Magee family to yours! It's not difficult or expensive to make this fun tablescape for Thanksgiving. It's perfect for the kids because they can draw right on the table! Add small bags of popcorn or mini pumpkin pies for added fun. 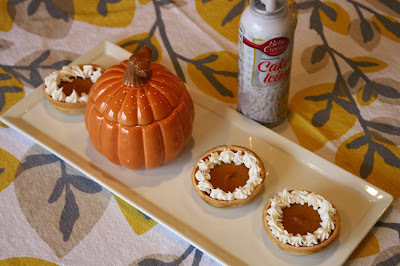 I'll be sharing the mini pumpkin pie tutorial later this week, so be sure to check back! Photography is one of my favorite hobbies. I like to think that I'm getting better at it, but I could always use more practice. I have tried a daily photography series on the blog before, but maybe this will be easier. Today I'm kicking off "Photo Fridays." I may not post every Friday, but I definitely would like to make this a regular thing. There is an abundance of ideas for fancy Thanksgiving table settings. Just browse the magazine aisle or pinterest and you will see what I'm talking about. I love the use of golds, plums, and oranges in so many of the tablescapes with nice linens and sumptuous feathers or flowers. They are so pretty, but they are not really for me. Inevitably when I set a fancy table, someone spills something and it makes a mess, so I set out to make a kid friendly table for Thanksgiving. The best part about this table? You can draw on it because the tablecloth is actually paper! Whether you set this table for kids or kids at heart, it's sure to please. Start by covering your table with a roll of brown kraft paper. Find some crayons, or these cool stick colored pencils, and put them around the table. These orange ramekins were only $0.99 a piece and fit in with the Thanksgiving theme perfectly. Kids, and maybe some adults, would love being able to draw on the table! It's a great way to keep the little ones entertained before dinner. Because I was going for practical, I used paper plates on this kid-friendly table. It's also a great idea to use cups with lids and straws! 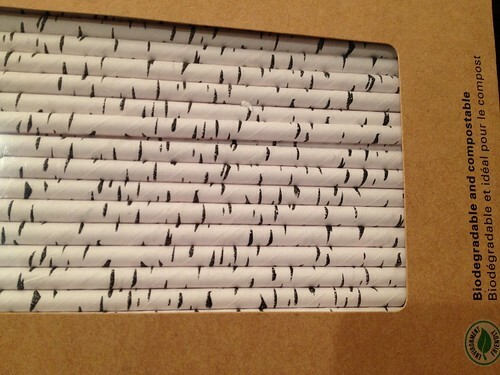 I love the paper straws that I found because they have a birch tree pattern. What else makes for a fun kids' table? 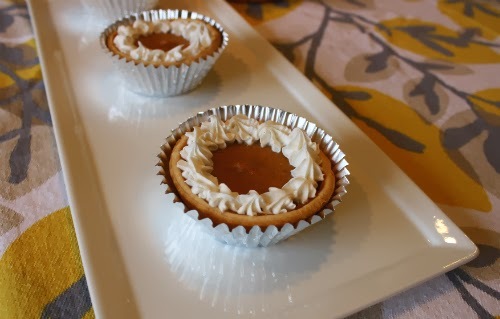 Mini pumpkin pies! Place cards could be as simple as writing each child's name on the table, but I enjoyed creating cute takeaways with letter stickers. I used feathers to add another natural element to the table. Another idea I came up with was to add popcorn to the table. It's a fun snack and is a modern spin on a classic element of Thanksgiving--corn! I hope that you are inspired by this kid-friendly table for your Turkey Day celebrations! Julee at D.I.Y. Louisville created a Thankful tree that would be perfect on this table! What are your plans this year? In case you missed me making this burlap wreath here is the video link. It really is an easy project that only looks like it was difficult to make. Your friends and family will be impressed! I hope you are enjoying the Fall season. It's getting colder and three local radio stations are playing Christmas music already--but I'm trying to hold onto Autumn for as long as I can! The colors of the leaves have changed, or fallen off the trees, which can only mean one thing--it's Fall ya'll! All the Halloween decorations have come down, including the witch on the front door, so it was time to make a wreath for Autumn. I think you will really enjoy this project because it is extremely easy, but looks like you worked very hard. One great thing about this decoration is that it can live indoors or outdoors. To begin, fold the end of the first roll of burlap ribbon in half and place underneath the wire wreath form. You can start in any place, so I just chose the middle. Using a length of floral wire (or a twist tie), secure the end of the burlap to the wreath form. 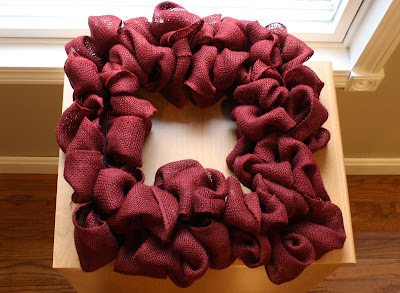 Once the end is secure, pull a loop of the burlap fabric through the top section of the wreath form. Next pull a loop through the bottom section. You will repeat this over and over. Loop through top, loop through bottom, repeat. Here is a photo of 4 loops (two on top and two on the bottom). Continue pulling loops of burlap through the different sections all the way around the wreath form. When you reach the end of the first roll of burlap (about halfway around), secure the end with the wire or twist tie. Then secure the end of the second roll of burlap like when you started, and continue pulling loops through from the back of the wreath form. You will notice that some of the wire form is visible as you build your wreath. This is okay, because you will scrunch as much fabric in each section as possible, and then when you are finished, you can open the loops where the fabric was folded in half. This fluffs up the wreath and hides the wreath form. If you are not satisfied with the fluffing process, you can use more floral wire to secure the fabric over the form so it is not visible. You can see here that after opening the loops and fluffing up the wreath, only the bottom left section has a piece of the wire form visible. I left this on purpose to have some sturdy to glue the leaves and monogram onto. 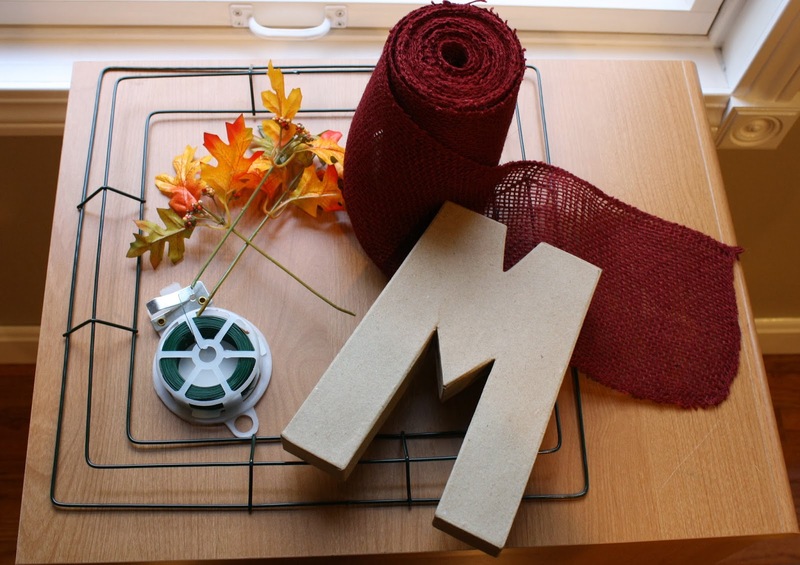 To make the monogram for this easy burlap wreath, I used a cheap cardboard letter purchased at the craft store. I painted one coat of dark and light green paint and let it dry. Then I painted all over with gray. I rubbed some of the gray off with a paper towel so that the green showed through. For added effect, you can use a brown crayon on the edges once the paint dries. This makes it look a little more vintage or rustic. While the letter is drying, you can begin to arrange the fake leaves on the wreath. I wanted some sticking out of the top and right side of the letter, following the square shape of the wreath. Use a glue gun to secure the leaves. If the glue looks a little messy it's okay, because you are going to add the letter to the wreath and it will hide that part. When the monogram is ready, glue the backside (which I left unpainted) with hot glue and stick it on the wreath. That's it! You're finished. You really won't believe how easy this project is! The part that is most time-consuming is painting the letter for the monogram. You can add a loop to the back of this welcoming wreath and hang it on your wall or front door. I think that I might be addicted to this project now. The possibilities for each season are endless! Just think: green burlap and red ornaments for Christmas, white burlap and blue snowflakes for Winter, yellow burlap and pink flowers for Spring, and more! 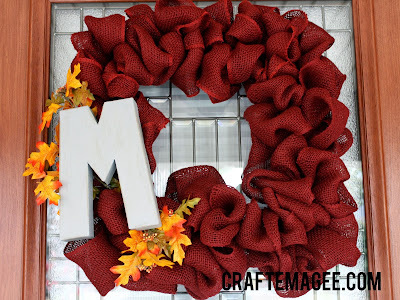 You could also make one base wreath and have interchangeable pieces instead of making separate wreaths. I hope that you enjoyed this perfect craft for Autumn! What do you like best about this time of year?